Mundelein Garage Door Repair and Installation | Overhead Garage Door Inc.
One look at the beautiful neighborhoods and well-kept properties of Mundelein can tell you that its residents take pride in the community they call home. A damaged or broken-down garage door can affect not only your property, but also the atmosphere of your community. When you need garage door repair service in Mundelein, don’t wait. Call the professionals at Overhead Garage Doors Inc.
A leader in the garage door industry, Overhead Garage Door Inc. is a certified dealer of Clopay Garage Doors and provides top-notch products, services, and value to homeowners throughout Mundelein. Our ongoing mission is to exceed your high expectations and increase your home’s value and aesthetic appeal. Clopay gives customers a wide range of styles to choose from, meaning your garage door will not only be functional, but also beautifully customized to your personal taste. Our professional staff is experienced and trained to install new doors or openers from our phenomenal selection of excellent products and can quickly—and affordably—perform much-needed repairs. Our technicians are knowledgeable and courteous, and they will provide you with total satisfaction in their services. Minor flaws or imperfections, damage from wild and unpredictable weather conditions, and dents from accidents are no match for the repair services available in Mundelein from Overhead Garage Door Inc. We will make your garage door look as good as the day it was installed by arriving promptly, assessing the problem, completely reviewing all potential solutions with you, and providing you with a comprehensive estimate before getting to work on your garage door. Emergency services are also available, with technicians ready to help you at any time, day or night. Product Lines: We invite all residents of Mundelein to take a look at our entire selection of products below, and we hope we are able to provide you with everything you need for your garage door. We would like to help you reach your goal of being proud of your property and of the Mundelein community. I decided this year that instead of hiring a contractor from my addition, I would go the renovation on my own. Yesterday the garage was finished and I thought I contracted the garage with a door…I know rookie mistake. I called the 1st 5 results on Google for door installations, and only 3 of 5 answered the phone. The two voicemails I left, I never even considered. Of the 3 remaining, only 1 made time for my wife and I after hours. 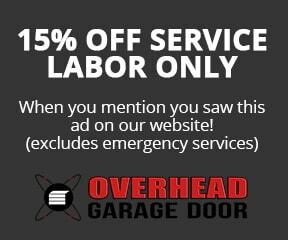 Thanks Overhead Garage, for being there when we needed you. SB did an outstanding/excellent job!